New York, London, Manila, Pune, Sydney – September 19, 2018 – Vela, a leading independent provider of trading and market access technology for global multi-asset electronic trading, announced the addition of key Asia Pacific (APAC) exchanges to SuperFeed, Vela’s normalized Market Data Feed. This continues Vela’s expanded presence in the region, providing new ways to access and trade both local and global markets. The initial implementation will deliver APAC exchange data to existing locations in Europe and North America. The exchanges being added to Vela’s SuperFeed include major futures and options markets within the region, specifically ASX24, Hong Kong Exchange, National Stock Exchange of India, Osaka Exchange, and Singapore Stock Exchange, with further markets due to be added in 2019 as well as access points within the region. 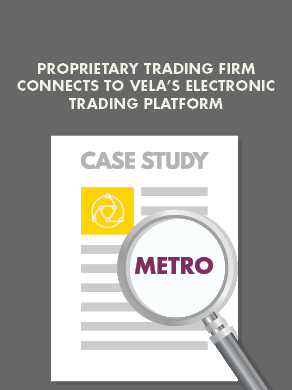 Vela’s SuperFeed provides low-latency, normalized data without the need for any client infrastructure, delivering the levels of performance, availability and reliability required of a trading quality market data feed. The addition of these new markets complements the more than 100 markets and data sources already available on SuperFeed, covering all major North American and European markets and the recently-added cryptocurrency coins and tokens from CoinMarketCap. This expansion is part of a wider plan to provide more in-region access to Vela services, including its Market Data Feed and DMA Platform. Throughout the remainder of 2018 and into 2019, additional access points including new in-region deployments of the DMA Platform within Exchange Co-location sites –starting with Tokyo – will be installed.